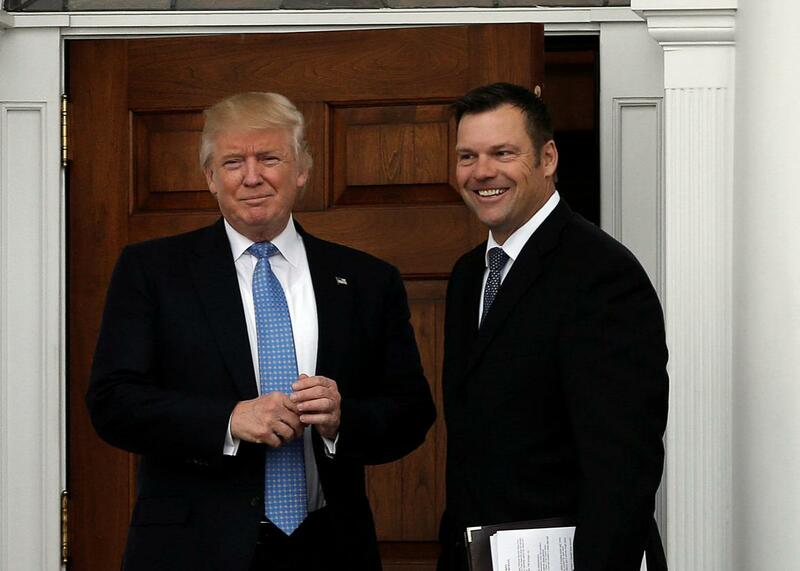 Kris Kobach is leading Trump’s vote fraud commission. That’s terrifying. The president’s new “election integrity” group will find fraud where it doesn’t exist and make it harder for Americans to cast their ballots. President-elect Donald Trump stands with Kansas Secretary of State Kris Kobach before their meeting at Trump National Golf Club in Bedminster, New Jersey, on Nov. 20. In isolation, this sounds unobjectionable. There’s nothing inherently wrong with creating a commission to address problems in our election system. The trouble is who is leading that commission: Vice President Mike Pence and, more importantly, Kansas Secretary of State Kris Kobach. Far from a neutral figure, Kobach is a fierce advocate for harsh, restrictive voting laws. By itself, his presence is a sign that this commission is a sham, and that the drive for “confidence” is actually a push to raise the barriers to voting and participation. To understand why Kobach’s presence on this panel is so alarming, you need to know his background. The architect of draconian anti-immigration laws in Arizona and Alabama—as well as the mind behind Mitt Romney’s “self-deportation” rhetoric—Kobach has been a prominent champion for voting restrictions. In the aftermath of 2013’s Shelby County v. Holder, in which the Supreme Court struck down key parts of the Voting Rights Act, Kobach emerged as a major voice for voter suppression. He has backed strict ID laws and pushed for states to require a birth certificate or passport for registration, measures that primarily burden low-income voters, including many voters of color. From his perch as Kansas’ top election official, Kobach has launched a crusade against “illegal voting,” winning power from state lawmakers to prosecute “voting crime.” In keeping with most studies of voter fraud—which find little to no evidence of its existence—Kobach has found just nine cases of alleged fraud out of 1.8 million registered Kansas voters. By making Kobach a co-chair for this commission, Trump has announced its actual purpose: to impose new strict requirements for voting and registration under the guise of “election integrity.” And while the commission may include Democrats, Kobach’s presence robs it of any credibility. It is a farce. It is important to say that Kobach isn’t unique in his drive for voting restrictions and that Trump’s obsession with illegal voting reflects the behavior of Republicans across the country. In states like Alabama, North Carolina, Texas, and Wisconsin, Republican lawmakers have slashed ballot access and pushed for tough identification laws. These laws fall hardest on voters with the least resources, who disproportionately are black and Latino. In the cases of North Carolina and Texas, federal courts have found that these laws were designed to disadvantage voters of color. Last year, for example, a federal court in Richmond, Virginia, found that North Carolina’s voter ID law “targets African Americans with almost surgical precision.” What we may see from Trump’s commission, then, are national variations on state-level Republican ideas, all of which are designed to shrink the pool of people who participate in our democracy. Unfortunately, the answer is likely yes. Who votes—and more broadly, who counts—is one of the most contested questions in American politics. If there’s anything that distinguishes today from the past in this regard, mostly universal suffrage aside, it’s that this is a fully partisan question. With few exceptions, Republicans press for restrictions, while Democrats push for expansion. And with restrictionists in the White House, now is an ideal time for Democrats to take up the banner of the franchise. From automatic registration and mail-in balloting to weekend voting and felon enfranchisement, there is a wealth of measures that would boost participation and access, while preserving the integrity of our elections. As Donald Trump begins his attack on voting, the Democratic Party should make voting rights its rallying cry, a first-order priority for any Democrat that wins office. More than a potential advantage for the party, it’s simply the right thing to do, a statement of belief in a democracy that, at this stage, needs all the help it can get.